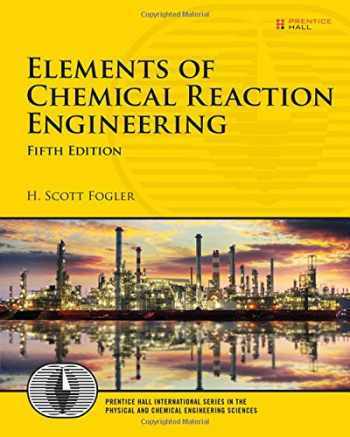 Acknowledged author H. Scott Fogler wrote Elements of Chemical Reaction Engineering (5th Edition) (Prentice Hall International: Physical and Chemical Engineering Sciences) comprising 992 pages back in 2016. Textbook and etextbook are published under ISBN 0133887510 and 9780133887518. Since then Elements of Chemical Reaction Engineering (5th Edition) (Prentice Hall International: Physical and Chemical Engineering Sciences) textbook received total rating of 3.5 stars and was available to sell back to BooksRun online for the top buyback price of $67.90 or rent at the marketplace. The Definitive, Fully Updated Guide to Solving Real-World Chemical Reaction Engineering Problems For decades, H. Scott Fogler’s Elements of Chemical Reaction Engineering has been the world’s dominant text for courses in chemical reaction engineering. Now, Fogler has created a new, completely updated fifth edition of his internationally respected book. The result is a refined book that contains new examples and problems, as well as an updated companion Web site. More than ever, Fogler has successfully integrated text, visuals, and computer simulations to help both undergraduate and graduate students master all of the field’s fundamentals. As always, he links theory to practice through many relevant examples, ranging from standard isothermal and non-isothermal reactor design to applications, such as solar energy, blood clotting, and drug delivery, and computer chip manufacturing. To promote the transfer of key skills to real-life settings, Fogler presents the following three styles of problems: Straightforward problems that reinforce the principles of chemical reaction engineering Living Example Problems (LEPs) that allow students to rapidly explore the issues and look for optimal solutions Open-ended problems that encourage students to practice creative problem-solving skills About the Web Site The companion Web site offers extensive enrichment opportunities and additional content, including Complete PowerPoint slides for lecture notes for chemical reaction engineering classes. Links to additional software, including POLYMATH™, Matlab™, Wolfram Mathematica™, AspenTech™, and COMSOL™. Interactive learning resources linked to each chapter, including Learning Objectives, Summary Notes, Web Modules, Interactive Computer Games, Solved Problems, FAQs, additional homework problems, and links to Learncheme. Living Example Problems that provide more than eighty interactive simulations, allowing students to explore the examples and ask “what-if” questions. The LEPs are unique to this book. Professional Reference Shelf, which includes advanced content on reactors, weighted least squares, experimental planning, laboratory reactors, pharmacokinetics, wire gauze reactors, trickle bed reactors, fluidized bed reactors, CVD boat reactors, detailed explanations of key derivations, and more. Problem-solving strategies and insights on creative and critical thinking.